Hi, Ruby Craft here. I’m so excited that Kim has invited me to be guest designer for May. She asked me to share a little bit about myself. A little over 10 years ago I had taken early retirement but had a little too much time on my hands. I decided I needed a hobby so I started Scrapbooking. 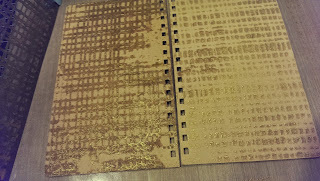 Then I took a part time job at a local scrapbook store and a co-worker showed me Tim Holtz and Alcohol Inks. 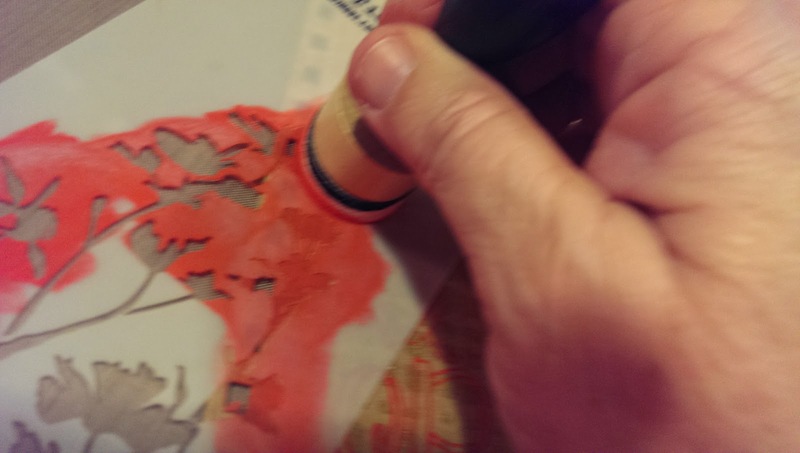 When Tim started his blog with a tour of his workroom and then began posting 12 Tags of Christmas I was hooked on inky fingers and multi media. I began blogging so I could post my tags for Tim’s challenges. 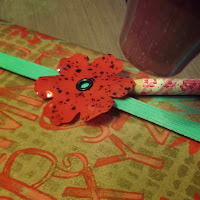 I still scrapbook from time to time but enjoy challenges, making tags, cards and the occasional 3 dimensional project. I'll be here every Wednesday this month with something new for you to see. For my first project I looked through my stash and found a naked spiral book I had bought a while back. I used 3 different stencils along with paints, so I worked on a non-stick craft sheet. It made clean up easy and also made a great pallet. The first thing I did was to carefully open the spiral and take out the covers. I then laid them face up on my work surface and placed the first stencil, Weaving for Prima Finnabair Elementals, on the front cover. I used Prima's Color Bloom Spray Mist in Gold Foil. This was the first time I used it and I loved working with it. It has a trigger sprayer which allows you to get quick solid coverage but also allows you to get a spatter effect if you want. I sprayed through the stencil onto the cover front. Instead of wiping off the beautiful mist that had beaded up on the stencil, I flipped it over and placed it on the back cover. This gave me the same beautiful shimmery gold but a negative of the pattern on the front. 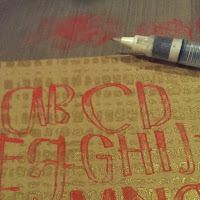 I used a fun stamp from Catherine Scanlon Designs called Catherine's Alphabet. This is a large one piece stamp that has open letters that would be perfect for water coloring. I thought it would make a terrific illustration for my cover. 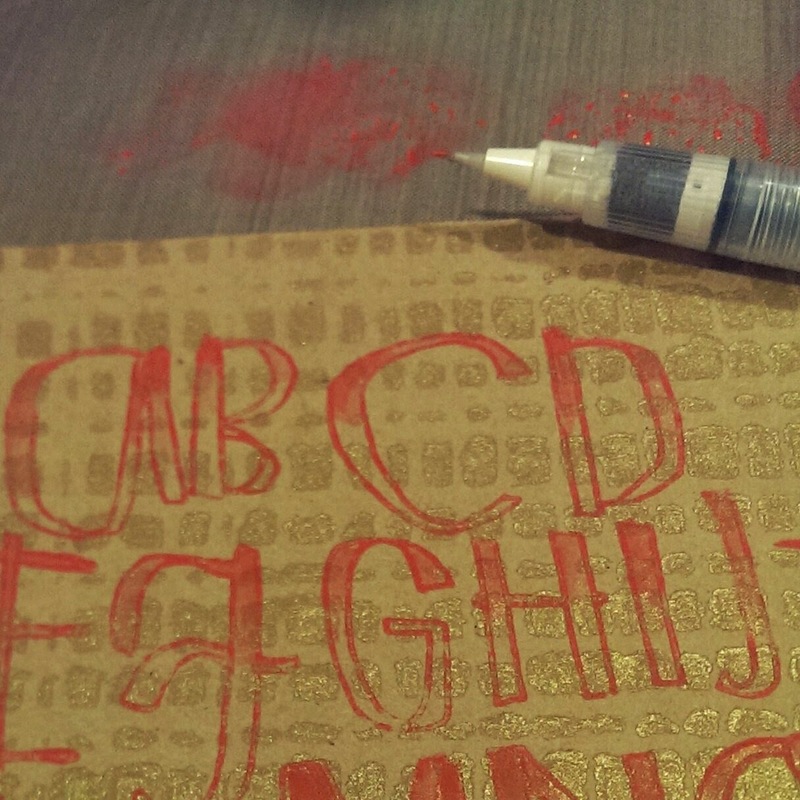 I used a brayer to "inked it up" with some Post Box Red Paint from Dylusions and stamped the front cover. I didn't get a perfect impression but it was perfect for the look I was going for. I decided I wanted to add a Flower border along the sides and bottom of the front cover and along the bottom of the back one. Tim Holtz Wildflower Stencil was perfect for this and the second stencil I used. I used a couple of mini blending tools to apply the Post Box Red Paint to the stencil flowers and then Cracked Pistachio Distress Paint for the stems and foliage. 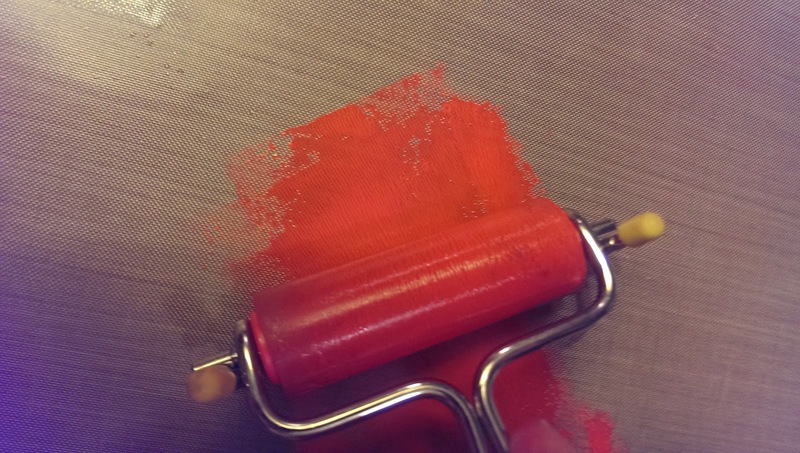 Distress Paints have a dauber top but the paint is very fluid and would run under the stencil if you tried to apply it directly from the bottle. The mini blending tool works great with the stencils and paints. The thin stems can be a little tricky with the blending tool. Once I removed the stencil I used a fine detail water brush to pick up some Cracked Pistachio from my craft sheet to touch up the stems. The water brush allow me to keep the color soft. 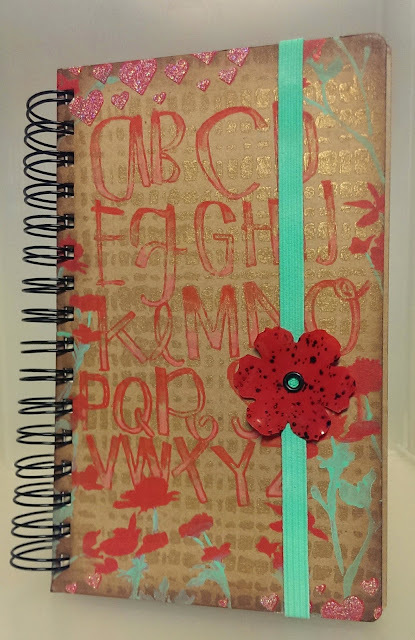 I also used the water brush to paint the inside of the letters with Post Box Red at the top and Abandoned Coral Distress Paint from the bottom of the letters fading the color out before reaching the middle of the letters. 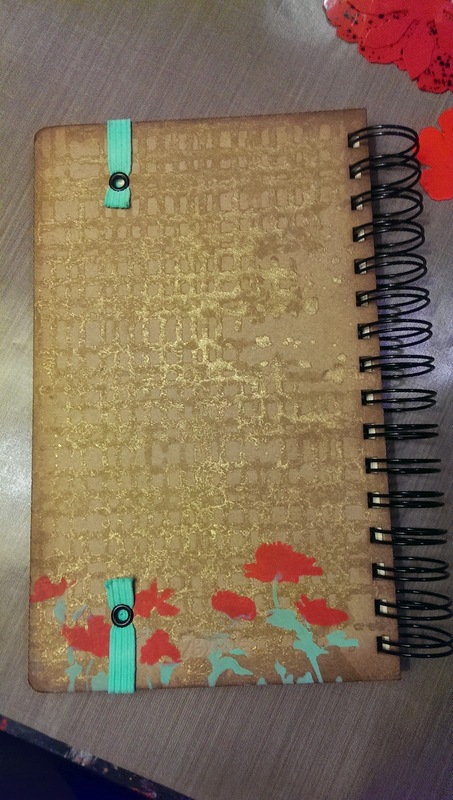 This allows the Gold Foil Spray to peek through. Another thing I liked that the Gold Foil Spray as a background is that once it was dry it was not disturbed by the water or paint. Along the very top and bottom of the front cover I used the third stencil, the hearts from the Love set of BoBunny Stickable Stencils. Again using the blending tool and Dylusion's Post Box Red. Once I finished the hearts I felt they needed something else. BoBunny Glitter Paste in Sugar! I used a palette knife and the stencil to apply it. 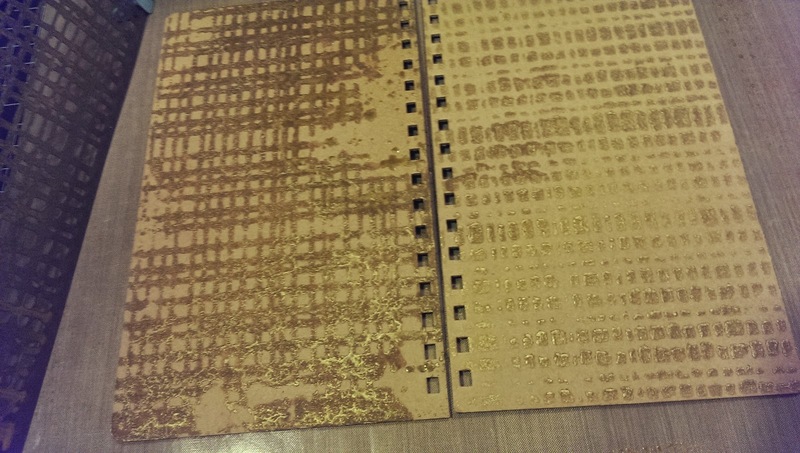 These stencils are sticky and reposition-able making them easy to use. I finished off the edges using the blending tool and some Vintage Photo Distress Ink. I decided I wanted to make a band to hold the book closed. I painted a piece of white elastic with Cracked Pistachio Distress Paint. Using the dauber top made it easy. 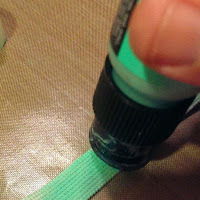 Distress Paint does not effect the elasticity or stiffen the elastic. Once dry I attached the strip to the back cover with eyelets. I die cut a flower from Wendy Vecchi's Clearly for Art Modeling Film from Tim Holtz's Tattered Floral die. Clearly for Art Modeling Film is NOT shrink film. When you heat it you can bend it to what ever shape you want and when it cools it will hold the shape. It comes in clear, white or black. 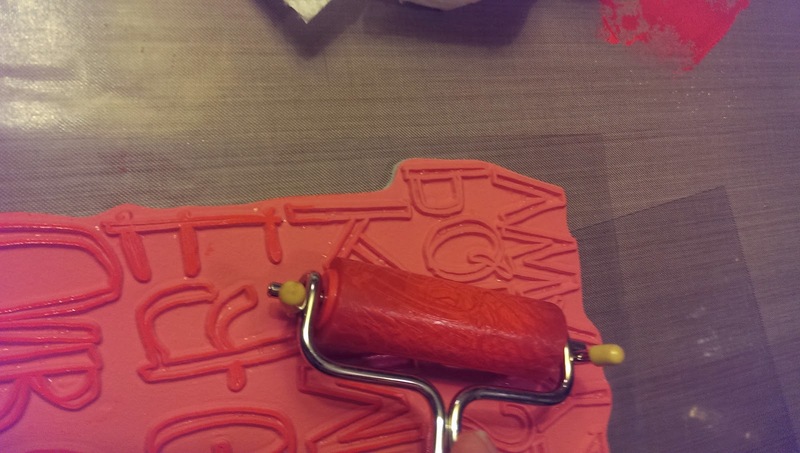 Before you mold it you can paint it, stamp on it, or glue paper to it and then stamp on the paper if you like. If you don't like the shape you can reheat it flatten it and start all over again. I used clear and painted one side red by simple spreading the Post Box Red paint on with my fingertips. Once dry I flipped the flower over and used the spatter stamp from Wendy's Faux Graniteware starter kit and some Jet Black Archival ink to stamp the black spots. 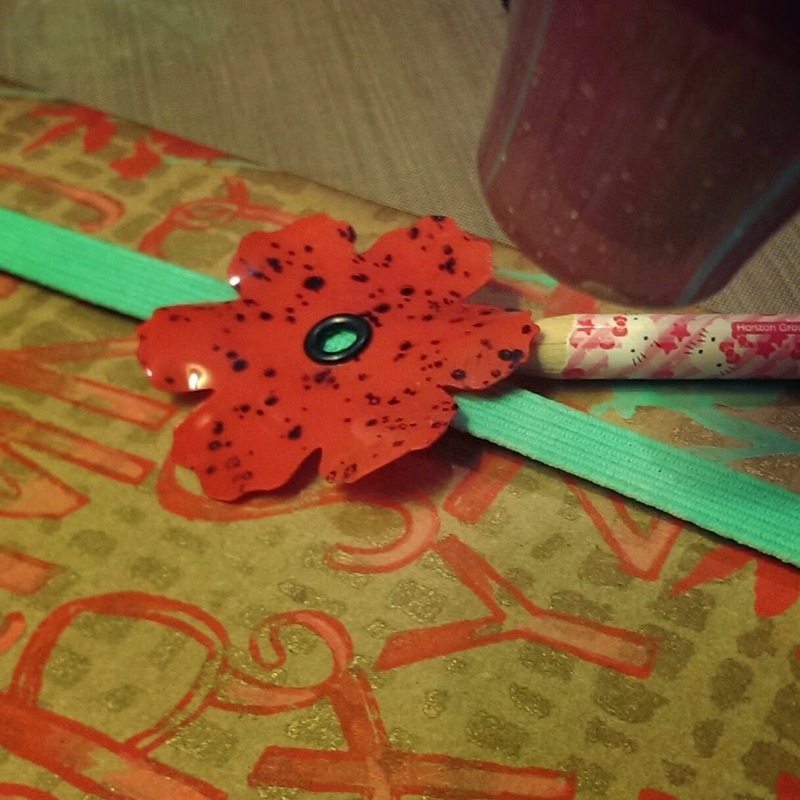 After the ink dried I attached the flower to the elastic band with a black eyelet. Then I was able to heat the flower with my heat tool and shape it. I just wanted the flower to have some subtle modeling since it was on the cover of the journal. I slipped a pencil under some spots while heating to get a little lift and did the rest of the modeling with my fingers. You don't have to heat the whole flower, just a small section at a time. Once I had my flower shaped the way I wanted it, my cover was finished and I put everything back together. I want to thank Kim for inviting me to be the May Guest Designer. She generously sent me quite a few fun products to use and she is wonderful to work with. She has designers for June, July and August, but if you are interested in being a guest designer in the future send her an email. I included a little information about myself and a few links to projects on my blog that I thought she might like and she got right back to me. Here are a few quick links to some of the products I used from eclectic Paperie. I Hope you enjoyed seeing how I created my first project as guest designer and that you'll be back next Wednesday. Hi Ruby, love this, so great to see what your creating. This is so cute! I love all the colors and the techniques. Great job Ruby! Really pretty, Ruby! You're so creative! Can wait to see what you come up with next.